Affirmations Publishing House has been using recycled paper with our products since 1988. 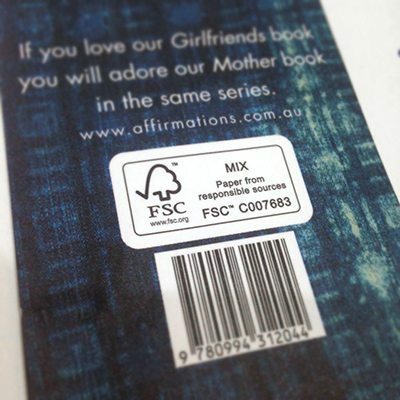 All Affirmations products are printed on a mixture of between 50 and 100% recycled paper or are sourced from FSC papers (Forestry Standard Certification). The objective of the FSC certification is to identify and recognise responsible forest management, to provide tracing methods to ensure the timber from managed forests are handled to the finished goods stage in a controlled and responsible manner. Our Gift Books are printed on 100% recycled paper. All our products are printed using vegetable-based inks. We truly value our environment, the restoration of nature and consider our future generations. We have always been committed to sourcing environmentally responsible paper and processes. Affirmations Publishing House is dedicated to staying up-to-date with latest research and industry news, so we are acting in the most well-informed and responsible way when producing our product. We have been working towards printing our entire range of products using Forest Stewardship Council (FSC) certified paper and vegetable-based inks wherever possible. The FSC certification is an international, membership-based, non-profit organisation founded in 1993 as an international network to promote responsible management of the world’s forests. The organisation also brings people together to find solutions to the problems created by bad forestry practices and to reward responsible forest management. FSC helps take care of forests and the people and wildlife that call them home. Our forests give us many things like books, tissues, furniture and so much more. FSC helps you keep your life full of forest products while keeping our forests full of life. What makes FSC unique is that it was founded – and are still operated by – environmentalists, social interest groups, indigenous peoples’ organisations, responsible retailers and lead forest management companies. As a non-profit membership based organisation, fsc.org are driven by the balanced perspectives of these diverse stakeholders. Through their 10 principles and criteria fsc.org ensure that forests are managed in a way that not only takes care of the animals and plants that call it home, but also workers and local communities who rely on forests, and indigenous groups whose heritage connects them to forest landscapes. The trusted FSC logo can be found all around the world and provides international recognition to organisations who support the growth of responsible forest management. HOW DO PAPERS BECOME FSC CERTIFIED? For a paper to become certified, an independent certifier must verify that the forest is being used and cared for in ways that are beneficial both for the environment and the people whose lives depend on these forests. Certification doesn’t stop at the forest, however. The FSC requires that the sustainable materials be tracked from the forest all the way through printing. This is called Chain of Custody and it ensures that only pure materials are certified. If there is any mixing of certified and uncertified materials, it must be documented and marked accordingly, like in the photo above. Ten principles and fifty-seven criteria must be met for the forest products to receive Forest Management and Chain of Custody certification. For a full list of these, visit the FSC website. The FSC is also committed to the economic stability of forest industries. They work to empower smaller “family forests” to meet FSC standards and remain profitable by connecting them with markets in which to sell their products. When a supplier places the FSC trademarks, it provides a guarantee to consumers that the products they buy come from responsible sources. The FSC trademarks enable consumers to choose products that support forest conservation, offer social benefits, and enable the market to provide an incentive for better forest management. The FSC trademarks are thus essential to the whole FSC system. It is extremely important to the integrity and credibility of the FSC system that our trademarks are used correctly. FSC have developed a comprehensive system for authorizing the use of FSC trademarks and take infringements of our trademarks very seriously. To use any the FSC trademarks, you must obtain authorization. Only suppliers with FSC certification are authored to legally place this mark as an individual mark is obtained specially for a print run. Anyone seeking to use the FSC logo, they MUST ensure they have the authorisation to do so. Unauthorised use of the FSC logo weakens the FSC system by jeopardising its credibility and undermining the many businesses that have chosen to be responsible through the FSC system. Our production department have had our suppliers send us certificates that they are authorised to purchase and use FSC certified paper. This article explains the various types of paper making processes and lists the big misconception between FSC certified forests and sustainable forests. Sustainable forests are VERY different to FSC ones in the way that they are managed. FSC is definitely the way to go there. One interesting point to make in the argument FOR FSC, is that YES, why 100% recycled makes a lot of sense, often the bleaching process involved can be worse than the point of using receded paper, which can only be recycled so many times before it becomes un-environmentally friendly. For Affirmations, we use FSC 100% recycled stocks where we can, otherwise if we don’t like browned paper, we stick to mixed FSC. We promise we are dedicated to this cause and happily welcome any questions around this process.